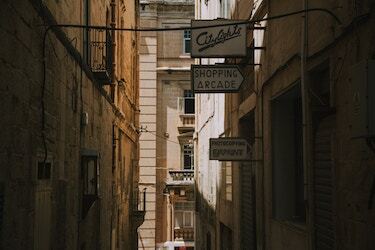 Shopping and site seeing go together like a bucket and spade when you’re in Valletta. The historical capital is also a Mecca for shopping and café-loungers, so it’s a great place to visit if you’re with friends or family – there’s something for everyone here. You’re bound to find something you like just by walking down Republic street. This main street that takes you from the entrance at City Gate to the bottom of St. Elmo. The street is always bustling with shoppers and site-seeing tourists. A walk along here will hit both birds with one proverbial stone. There are, of course, many more, and if you’re looking for holiday souvenirs or jewellery, you’re going to find plenty along the way. You simply have to walk around the streets to see and absorb the history of Valletta. It lives and breathes history through its architecture. The city was designed by Italian architect Francesco Laparelli (previously an assistant to the great Michelangelo) who was commissioned by Jean Parisot de Vallette, the Grand Master of Malta at the time. A night walk is ideal to truly appreciate the unique buildings. The morning hustle and bustle of shoppers can distract you into missing some of the gems this capital city has to offer. The beauty of these buildings is striking just by walking past them. Along the way you will also see some baroque churches and chapels as well as private homes built in traditional limestone with wooden beams. The great thing about all these Valletta sites is that you’re never more than 15 mins away from a GoTo car sharing parking location. So, you don’t need to worry about how long you stay. You can start your day shopping, go for lunch, visit a museum in the afternoon and then enjoy a quiet architectural walk during or after sunset. When you’re ready to head back to your hotel, just book a GoTo car from the app and you’re good to go in under 15 minutes. Just pick up a car sharing car from the street after your in-app booking is done. Register and download the GoTo app and get all set-up before your holiday.